Nokia has churned out lots of devices in the course of 2018, and while we are a bit set off by its naming scheme and relentless announcement of new devices every other month, we can agree that most of its offerings are excellent phones by large margin, particularly if you put them side by side to their competitors in the same price bracket, especially in the Kenyan market. One of HMD’s Q4 releases is in the form of Nokia 6.1 Plus (or X6 in other markets). In the last one month or so, I have had a chance to play with the 6.1 Plus immediately after I was done checking out Android 9 Pie on the 7 Plus, whose successor is confusingly the Nokia 8.1 that went live a couple of days ago. On the whole, the 6.1 Plus stacks up well in practically all aspects, including better ergonomics, battery life and runs cooler than the 7 Plus (I will be drawing comparisons to the 7 Plus because it’s the closest Nokia device I have used that rivals or builds on the 6.1 Plus’s offerings). Every time I use a Nokia device, a wave of nostalgia hits me to remind me of the time when the Finnish manufacturer commanded the lion’s share of the mobile phone market, which is before the likes of Apple and Android-powered devices claimed the crown. I’m also overwhelmed by the fact that HMD raised the bar to what a mid-range device should constitute because the 6.1 Plus is constructed very well, and I continue to enjoy using the glass-backed handheld that you would think costs more than KES 40,000 (it 10-15K cheaper). The 6.1 Plus has a screen cut-out on its 5.8-inch, a small chin at the bottom that also houses the Nokia logo. 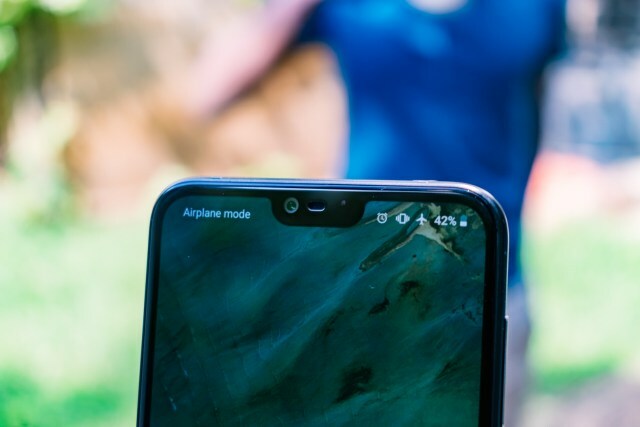 The notch is also home for the 16 MP front snapper and an earpiece. It should be noted that the groove is not that wide to evoke your distaste for cutouts. It is also not as annoying or jarring as those we have seen on competing devices. Nokia 6.1 Plus NotchNokia has also done an okay job in terms of display quality for the 6.1 Plus. It is a good screen that gets plenty bright outdoors. It is capped at 1080+ (I can count two or three similarly priced phones with 720p screens), and that resolution is perfect and acceptable for me because high-res displays have not improved my media consumption and viewing experiences. Also, a modest and functional resolution is key to great battery life (more of that in a minute). Unlike some even low-tier Samsung devices such as the J6 2018 that have Super AMOLED screens, the 6.1 Plus ships with LCD display – but as we have mentioned, it looks great for my daily operations. Nokia 6.1 Plus TopThe volume rocker and power keys are placed on the upper right side of the device. The right side is equipped with a hybrid SIM tray that can either take two SIMs or a SIM card and an SD card. All other bells and whistles, including mics, USB-C charging port, a headphone socket, and single bottom-firing speaker are at their right place – although I would have preferred the jack at the bottom. Lastly, the back-glass panel houses a dual camera setup vertically positioned right above a reliable fingerprint scanner. As we noted, the 6.1 Plus has a dual camera setup that is packed with tens of megapixels: 16 MP for the main sensor and 5 MP depth sensor for portrait shots because that is what modern phones do. The front snapper is an impressive 16 MP, which, without digging further into the details, is pretty good (see attached selfie in the gallery below). On the whole, the Nokia 6.1 Plus’s camera prowess is good, although it falls short of the 7 Plus’s capabilities. Its updated interface (that was packed with a December security patch), packs all the features we have come to expect: a pro-mode (that is pretty basic), live bokeh for portrait images, white balance presets and even a slow-motion mode for video. The Snapdragon 636 chip is also capable of shooting 4K video, which Nokia generously includes in the camera settings. In fact, you can even shoot using front and back cameras (Boothie) and access Google Lens right from the app feature set. Those who love streaming material can do so too, but the options are limited to YouTube and Facebook. These features, while appealing to a lot of people, mean nothing if the quality of the images snapped is not good, but that is mostly not the case. I have had a good experience with it (although I dedicated my shots using a Google Cam port from XDA Developers), and I can confidently report that its colour processing is good, with more than average daylight image samples that feature impressive colour reproduction. However, folks with a keen eye, especially the lion’s share of current and potential buyers that will use the stock camera app will notice a fair amount of noise even in images captured in bright surroundings. Dynamic range is subjectively average too, which is not a good thing to say in a world where smartphone photography has grown so much. On the bright side of things, the Google Cam Mode fixes HRD mode by a significant margin that brings out more details that I appreciate. Lastly, and similar to most cameras, low-light photography is outright mediocre. Shots captured are serviceable if you fire up the flash, but they are nothing to write home about. Most of Nokia devices fall under the Android One Program, and the 6.1 Plus is a beneficiary to that experience that was primarily made to ensure that several budget-friendly devices are updated to the latest software versions without necessarily purchasing Pixel phones. Currently, the 6.1 Plus runs Android 9 Pie, which was available as an over-the-air update as soon as we unboxed it. Nokia 6.1 Plus DisplayThe general look and feel are stock-ish, although Nokia has customized the camera slightly. Also, HMD has added a Support app in a mostly clean and bloat-less app drawer. Customization options are familiar too, and we captured most of Pie features in our Nokia 7 Plus overview that I encourage you to read because the experience is identical but as a recap, your wallpaper of choice will determine whether your notification shade is dark or white – although the Settings panel and other parts of the interface will be white – as well as additions such as gesture-based navigation (you can also double-tap the display to wake (no double-tap to sleep that is more convenient according to me)) and Digital Wellbeing that takes note of the number of unlocks/notification received in order to push you towards productivity. There is a setting that disables the notch that I discovered today (although the LCD panel does not turn to die black to hide it entirely – but I’m glad the option exists), but you cannot whitelist some apps to access the notch area owing to limited customization options packed in the device. This implies that some transitions will be jarred, particularly when pictures shift to and from full-screen mode. It is an eyesore once you notice it. Some of these software issues are nit-picky, and most people are not going to notice them if they just leave the notch activated. To this end, I’m certain users are and will enjoy the Android One experience in the Nokia 6.1 Plus. Yes, you will miss some customization options available in other skins, but the minimalist approach to Android will also be welcome to groups that appreciate a smooth experience and relatively timely updates. The 6.1 Plus packs a 3060 mAh cell that may appear small by today’s standards, but don’t let the number fool you. It lasts a full day of light to moderate usage, perhaps thanks to the handheld’s relatively small display and under-the-hood optimizations in Android 9 Pie. It also packs a midrange chipset that is modest in power requirements. What’s more, the device supports Qualcomm’s Quick Charge (number not specified) that charges it relatively fast. The included power charger and USB Type-C cable are serviceable. Nokia 6.1 Plus BottomBtw, the last update bunched the battery indicator and battery percentage to make some room on the notification bar to make room for other icons. We are fans. Battery stats aside, the retail package only include some muddy earphones, charger, and cable, a SIM ejection tool, warranty and user guide materials. No case is in sight (the 7 Plus packed one), and Nokia loses some points here owing to its fragility. Nevertheless, you can always pick a case from retailers if you want to keep the device safe and pristine. There aren’t many small phones out there no more. The 6.1 Plus fills that space just fine, especially for the 25-30K bracket. It also makes a case for itself for what it offers and appeals to a broader target customer base that probably associates Nokia with quality. Nokia continues to nail user experience with a clean version of Android that has allowed them to push big updates faster than the competition. Locally, no other manufacturer does better, and that is a win in my books. Part of not packing lots of features in a device is that it cuts down on time and resources used to customize the Android experience. While that may sound like a letdown for some people because more is sometimes better, having an uncluttered experience is refreshing – and the experience is the same across modern Nokia smartphones. You might have realized that I did not mention anything about general performance. Well, it is mostly insignificant and trivial because modern chipsets have gotten so much better. Unless you really need the power offered by high-end SoCs, the Nokia 6.1 Plus’s performance is admirable for most of you. This, however, does not imply a smooth experience at all time: apps like Candy Crush Saga lag and general slowdowns are seen from time to time, but not often. Nokia should think about shipping new, better-looking and good-sounding earphones in the future. The ones included in the box are what the manufacturer used to pack with its Symbian-powered phones more than a decade ago. It is not fair because they sound terrible. Can we have a case in a device that as fragile as the 6.1 Plus? The fingerprint scanner is accurate at all times. I’m a fan. The 75K price range just got more competitive with the launch of the OPPO A7 and TECNO Camon 11 Pro, Xiaomi Mi A2, among other options such as the Samsung Galaxy J series. The devices have a lot to offer: the A7 has a huge battery and lots of nifty ColorOS features; the Camon 11 Pro has a cult fanbase, although it falls short in terms of software and display resolution at only 720p (same case with the OPPO A7); and lastly, the Xiaomi Mi A2 has stellar battery life, packs a clean Android version based on Pie (thanks to Android One), has a more powerful chipset but lacks a headphone jack. All these are excellent options, which makes the picking process a challenge for customers who are too picky.